The cave was prepared by Bnei Brith and the Jewish National Fund as a memorial site and a place of solidarity with the memory of the holocaust victims at official ceremonies. In 1951, the forest was planted with six million trees in memory of the six million jews who perished in the holocaust. The Bnei Brith cave is the main site of the Kislun riverbed, along the riverbed, mentioning the names of various communities that perished in the holocaust. To the left of the cave are steps leading to an observation point, along the path, explanatory points have been set up related to the story of Anne Frank. 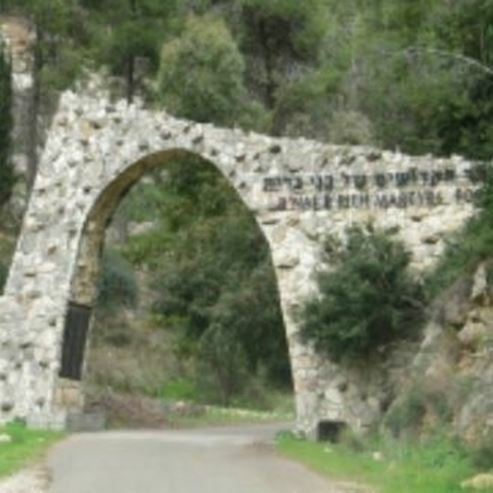 In the months of February to March, the blossoming of amond trees, the flowering of cyclamen and anemones, near the cave's expanse JNF prepared regular paths and picnic tables, a parking lot that serves as an exit point for tours in the Martyrs' forest and a campsite for the night. The Bnei Brith cave attracts many visitors throughout the year, including hundreds of cyclists, families with children, young couples, those who walk along the Trans-Israel Trail that passes through the Kislon riverbed and more. B'nai B'rith cave serves as a a place of communion with the memory of holocaust victims at official ceremonies (the cave is closed to visitors). The JNF has prepared a large gathering area, picnic tables and orderly paths. From Route 1 Tel Aviv-Jerusalem, exit right at Sha'ar Hagai to road 38, drive to the Eshta'ol junction, turn east onto route 395, then about half a kilometer turn left (felam winery) and drive on a paved road to Bnei Brith cave.